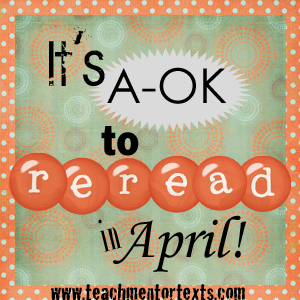 Last year in January, we had a blast participating in John Green Week and then we reviewed the awesomeness that is The Fault in Our Stars by John Green during Book Blogger Appreciation Week in the fall. As I read The Fault In Our Stars, I highlighted passage after passage, line after line of amazing. I was in awe of the whole book...I totally understand that not everyone shares my complete and utter, and maybe irrational, love of this book but it's hard to deny that this book is a great book. It happens to be my favorite John Green book and what I believe to be the best of what he has written so far. Enough of my gushing about The Fault In Our Stars though. My goal in rereading this month is to focus on what great snatches of text I find in the books I'm rereading and also what I can learn for myself as a writer from my rereads. I have specific examples of each of these today! *Please note that all page numbers are from my e-book copy that I have on my Nook so they may not exactly match up with the physical copy of the book. At the beginning of The Fault In Our Stars, John Green introduces us to Hazel, Isaac, and Augustus. I love reading how authors carry out the exposition in books. How exactly do they introduce us to a character while at the same time start to share the story? There is definitely a finesse to this and it's not easy. In the two passages below, you can see how he weaves in description of the three main characters. Notice how each character gets a jam-packed paragraph that helps us visualize each of them. Word choice is insanely critical here because I'm guessing John Green wanted to give readers a clear picture of each character without spending too much time describing each of them. I also love how critically Hazel describes herself and what that tells readers about her. Readers have a lot of clues to help them infer what Hazel thinks of herself. "The only redeeming facet of Support Group was this kid named Isaac, a long-faced, skinny guy with straight blond hair swept over one eye. "A boy was staring at me. I was quite sure I'd never seen him before. Long and leanly muscular, he dwarfed the molded plastic elementary school chair he was sitting in. Mahogany hair, straight and short. He looked my age, maybe a year older, and he sat with his tailbone against the edge of the chair, his posture aggressively poor; one hand half in a pocket of dark jeans. Writing Challenge #1: Describe yourself or a character in five sentences or less. Read over your description and revise to make it as concise and full of punch as possible. Writing Challenge #2: Sum up yourself or a character's story in 6 words. For examples of Six-Word Memoirs for teens, check out SMITHTeens. I love comparing similes and metaphors with students and talking about how they help readers visualize. I've had many discussions about literary devices and just why an author chooses to use them and which he or she decides to employ. I have always felt that metaphors elicit a stronger conviction. The above metaphor is one of my absolute favorite lines from The Fault In Our Stars. It seems to have a very different tone when compared to the above simile although both definitely help a reader imagine. Writing Challenge #3: Write a description as a simile and as a metaphor. Compare how your description changes depending on how it is written. Which one do you like and why does it resonate with you as a simile or as a metaphor? I love using Jeff Anderson's strategies for using snatches of text to ask students to look at what they notice about sentences and grammar. The above quotes from The Fault in Our Stars are all examples of two independent clauses connected with a conjunction. When you connect two independent clauses with a conjunction, you need to put a comma before the conjunction. I like that the sentence lengths vary because it's not about the length of the clause that makes it independent. It's about whether it can stand alone. Writing Challenge #4: Look at your own writing and see if you used commas correctly when joining together independent clauses. Do you have any sentences that can be joined with a conjunction to give some variety to the sentences in your writing? Penguin Group Australia put together a great Teacher's Guide for The Fault In Our Stars. I especially love all the wonderful quote cards at the end that can be printed for use in discussion or in various other ways. I hope you enjoyed revisiting the stellar-ness of John Green's The Fault In Our Stars. It was the perfect read to start off my month of rereading. 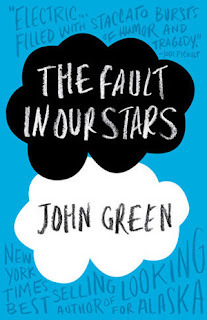 I would love to hear if you have used The Fault In Our Stars as a mentor text and how you used it or plan to use it. As always, thanks for sharing!